Sam, aka Rapido USA, (although he's no one's uncle), is a sweet red fawn male born in July 2000. His sire is Oshkosh USA and his dam is Rapido Babe. His grandsire was HB's Commander. Sam was quite the competitor, winning his last race on August 11, 2004 on the Jacksonville Circuit. 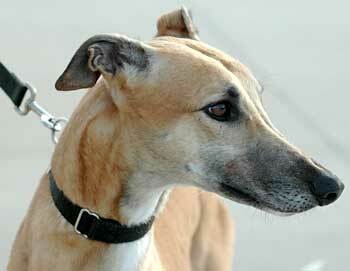 He ran 152 races from February 10, 2002 until August 15, 2004, so retirement is looking really good to him. Sam passed his overnight cat test nicely. He was curious but didn't get too close. All he wanted was a sniff. Sam was a well-mannered house guest during his visit with the cats. 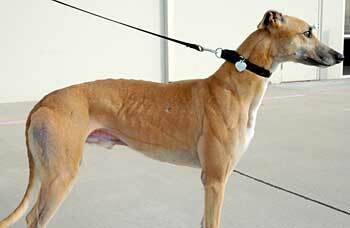 He gets along well with other greyhounds and is cat trainable. 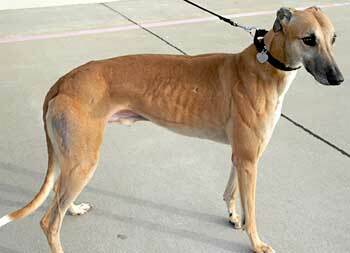 Sam was lost for six weeks - read his amazing story!